Got Pests? 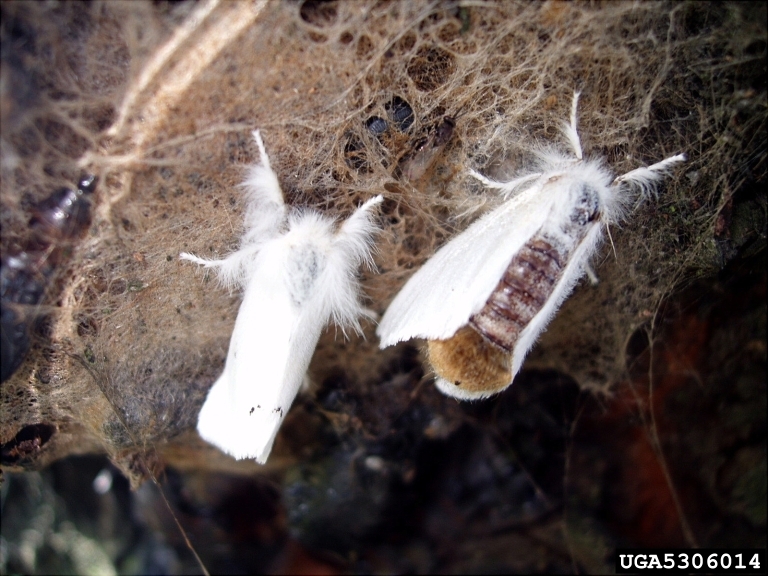 Browntail Moth: GotPests? The browntail moth was accidently introduced into Somerville, Massachusetts from Europe in 1897. It has recently become a big problem in coastal Maine. The larval stage (caterpillar) of this insect feeds on the foliage of hardwood trees and shrubs including oak, shadbush, apple, cherry, beach plum, and rugosa rose. 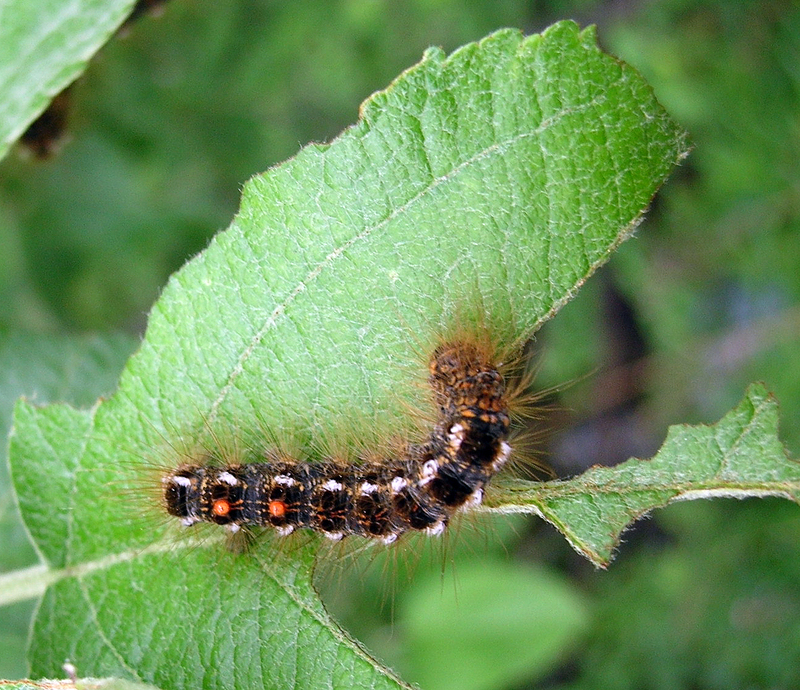 Larval feeding damages and sometimes kills the host, but the primary human impact from the browntail moth is the result of contact with poisonous hairs found on the caterpillars. The hairs on the caterpillars can float through the air on windy days. They can land on humans or things that humans later touch and cause a rash. Some people have severe allergic reactions to the caterpillar hairs. The rash often appears on skin inside the elbow, around the waist or on the neck. Some people also have breathing problems from inhaling the hairs. 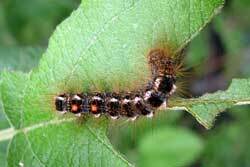 The browntail moth larva has prickly hairs covering its body. It has two broken white lines on each side of its brown body and two orangy-red spots on the end of its back. These dots are one behind the other. The caterpillars grow to about 1½ and are active during May and June. In late June the caterpillars spin cocoons. 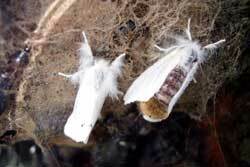 In early to mid-July the moths break out of the cocoons and mate. They lay eggs on the underside of leaves. 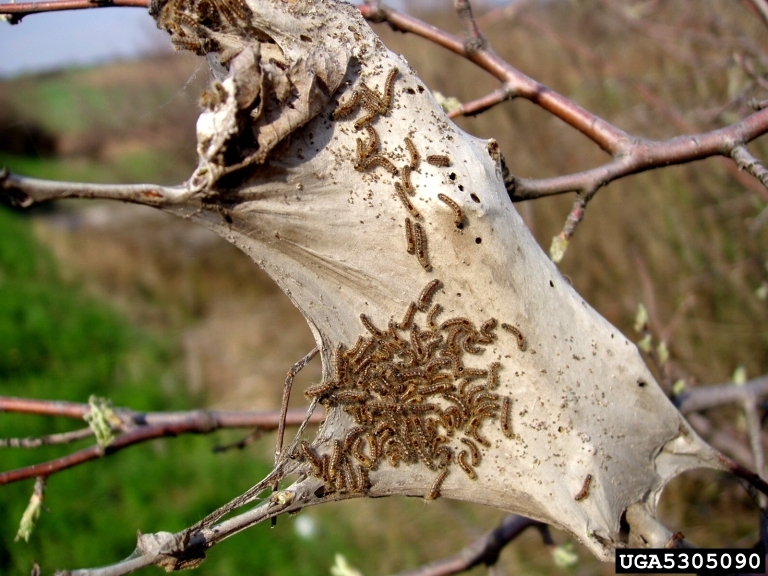 In late August the larvae hatch from eggs laid on the undersides of leaves and form overwintering webs in trees and shrubs. The nests are silvery white and may have leaves incorporated into them. The webs are 2 to 4 inches long, and are found at the tips of branches rather than in the crotches of the tree branches. They glisten in the sun. 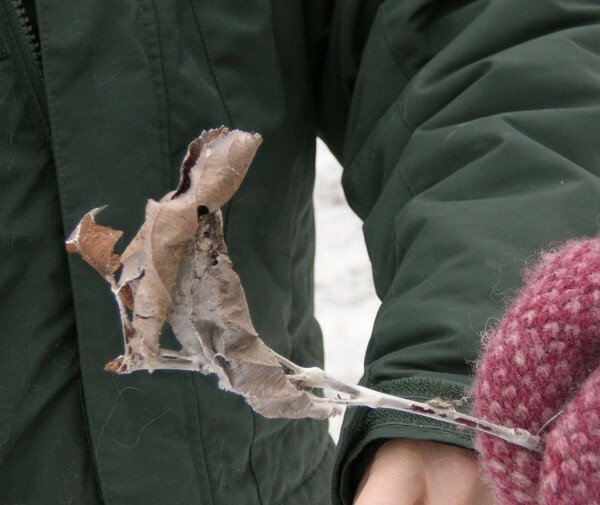 The nests are much smaller than tent caterpillar nests. There are 200 to 300 larvae in each nest. The tiny caterpillars emerge from the webs in late April most years.